Hi! 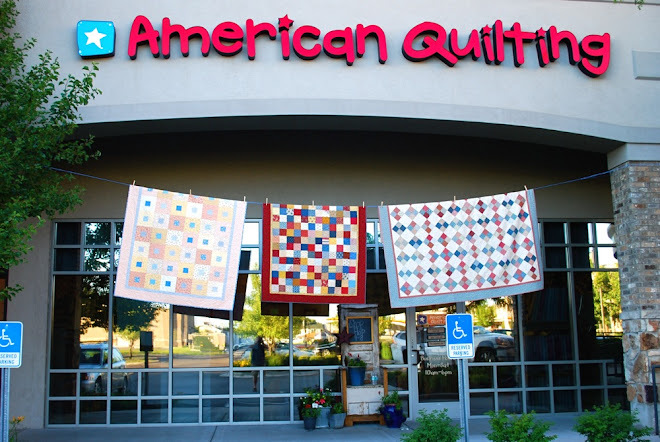 Welcome to American Quilting's new adventure. My name is Amy, I've been the shop owner for 5 1/2 years now and decided to jump in and join the Quilting Blog World. Make sure to check in and see if I can do this. It will be fun and interesting for me as well as you. New products that come into the store. New patterns and quilt designs. Some of my own creations and patterns. Any other fun and exciting things I want to share. Remember to stop by the Quilt Shop and say Hi! If you do and mention you saw this on my blog I will give you a free fat quarter. Hooray Amy! I think this will be great! I'm so glad to have found your blog! Welcome to blogland. Amy!! Cute blog ... it was great to see photos of the quilt garden party! and of your newly organized sewing room! How inspiring! Yay! A Blog from my favorite store of all! I am going to put a link on my blog, alright? Nice to see this blog and I'm new to blogging also. Love you and the store and always learn so much from everyone associated with American Quilting.